You can download a PDF of the source text in Devanagari here. This is the Kashmir Series of Texts and Studies, No. 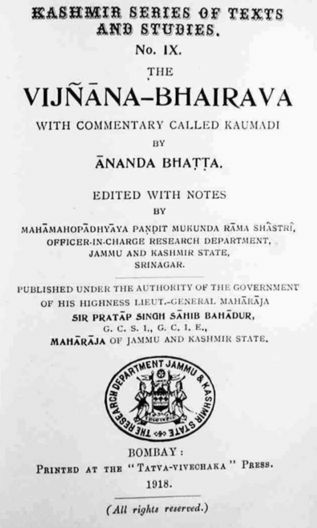 IX, “The Vijnana-Bhairava” with a “Commentary Called Kaumadi by Ananda Bhatta.” Printed at the Tatva-Vivechaka Press, Bombay, India, 1918. Date: July 1998, Text converted to Unicode (UTF-8). (This file is to be used with a UTF-8 font and your browser's VIEW configuration set to UTF-8.) Gandharva-nagaram / DSO Sanskrit Archive. This transliteration is also available at Università degli Studi di Roma "La Sapienza. " Facoltà di Studi Orientali. Link. under the supervision of Dr. Mark S. G. Dyczkowski, using various transliteration schemes. Revision June 14, 2007.
the 'high' language and used mainly for religious and scientific discourse. 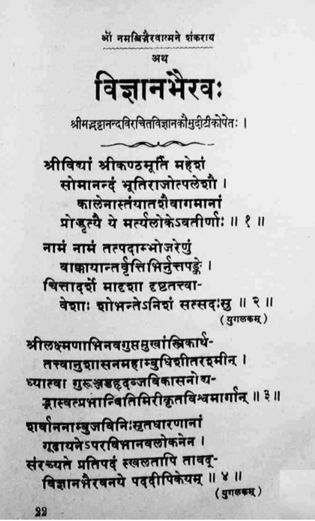 Hindu hymns, composed during the 2nd millenium BC. Sanskrit is one of the 17 official home languages in India. the Brahmi, Kharosthi, Sharda, Siddham and Bengali alphabets. (IAST), which was been the standard for academic work since 1912.